Hand pads are available for use with both abrasive discs and sheets. The 5" and 6" palm pads allow you to contour discs to shape of your hand. The #596 and #550 sanding blocks are a unique design that allows a 5" (596) or 6" (55) disc to be quickly converted to hand sanding flat surface. The blocks ergonomically fit your hand. These are handy when you have discs in your shop. The #544 and #545 are hand block designed to be used with 2-3/4" wide strips. 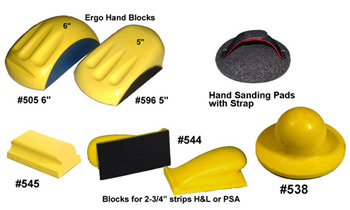 The #538 pads are molded foam palm sanders for use with 5" PSA or H&L discs.